Just over a year ago, the History Theatre presented a new play with music called Complicated Fun as part of their annual Raw Stages festival. The full production opened last night, and while it maintains the humor, complexity, and fun that was present in the reading, adding all the elements of a full production has taken it to a whole new level. This very Minnesotan story about the Minneapolis music scene of the early '80s is like a long-ago unknown history play to me, something that the History Theatre does very well. Although I'm of the right generation, I was perhaps a bit too young, a bit too suburban, and much too nerdy to be aware of what was going on in downtown Minneapolis clubs, most notably, First Avenue (a venue I've only visited a few times in recent years to see my folky faves Glen Hansard and Punch Brothers). So while people who lived through and loved this musical era will probably enjoy this piece in a much different and perhaps more meaningful way than I, for the uninitiated it succeeds as great theater that invites us into an unfamiliar experience and world. Our entry into this world of music is an unnamed boy and girl. The boy is introduced to the Minneapolis music scene by his older cousin, and falls in love with the music and the girl, an aspiring musician. We see them at parties, record stores, and of course, First Ave. Other characters include two record store employees, typical music nerds who argue about which band is the best, and get annoyed when their favorite band becomes popular and "sells out." We also see behind the scenes at First Ave as the manager Steve just wants to bring in good bands and the people who love then, not realizing that he's starting a revolution. Many in the large cast play multiple characters coming into and out of the story, at times making it difficult to track who's who. But the general throughline is clear: music brings people together and is a celebration of life, although in a "complicated" way. 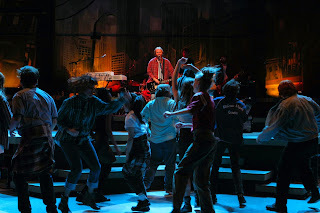 The large ensemble cast is terrific and the inclusion of students, mostly from St. Paul Conservatory for Performing Arts, as dancers and ensemble members adds a youthful energy to the show, especially as they run up and down the aisles and bump around on stage. Highlights in the cast include Bowen Cochran and Stephanie Bertumen as boy and girl, growing up before our eyes; Josh Carson in a funny-angry performance as the lovable grouch Steve; Andrea Wollenberg, who creates a multitude of characters in a series of increasingly bad wigs; and Joseph Miller and Skyler Nowinksi as the record store clerks who are obnoxiously and charmingly passionate about the music they love (and hate). There's a ton of music in this piece, but it's not a musical. The music takes place in context and is rarely sung by the characters, but rather by a band on stage at the clubs or parties. Music from such Minnesota bands as The Suicide Commandos (the title of the play is one of their songs), The Replacements, The Suburbs, Hüsker Dü, Soul Asylum, and The Jayhawks, with even a Greg Brown song thrown in for us folk music (aka punk country) fans (yay Red House Records!). The four-piece band led by Nic Delcambre does a fantastic job bringing this music to life (although I have nothing to compare it to, having never heard the originals). 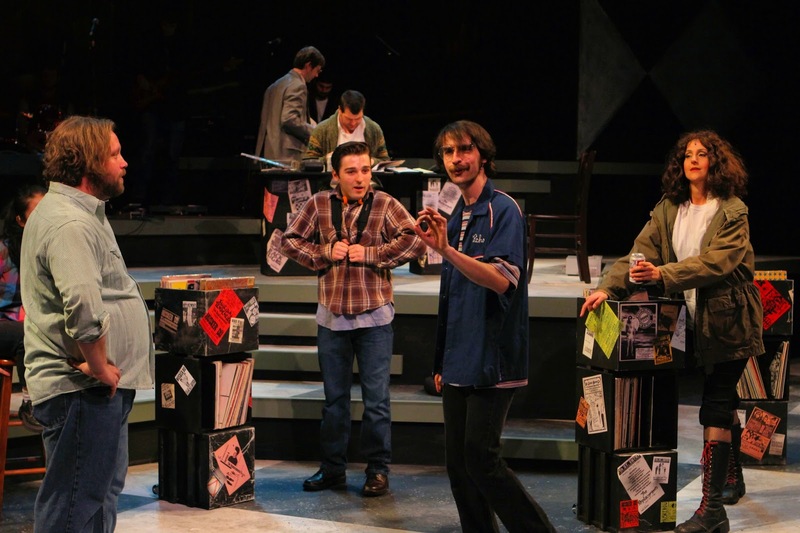 And while the band mostly stays separate from the story, they're also integrated into it, as the ensemble cast watches and reacts to them, and sometimes joins in on singing. It's really a great example of integrating music into the storytelling in an organic way. And of course, you can't talk about Minnesota music without talking about Prince, and talk about him they do. Due to the difficulty and expense of gaining rights to his music, we never hear any of Prince's songs (except for the boy's mangled rendition of "Purple Rain), but his presence is powerfully and poignantly felt, especially in the wake of his recent passing. Above all this play is a celebration of the music scene he helped to create. Set designer Michael Hoover has created a stage on stage, with multiple levels and stairs forming a dynamic performance space. Director Dominic Taylor uses it well, often with more than one scene occurring in different locations around the stage. Choreographer Carl Flink has given the ensemble some crazy fun dancing that looks chaotic but must be intricately planned. Amelia Cheever's costumes transition from an almost '70s vibe in the early '80s to the high-waisted pleated pants and stone-washed jeans era of the '80s that I remember too well. 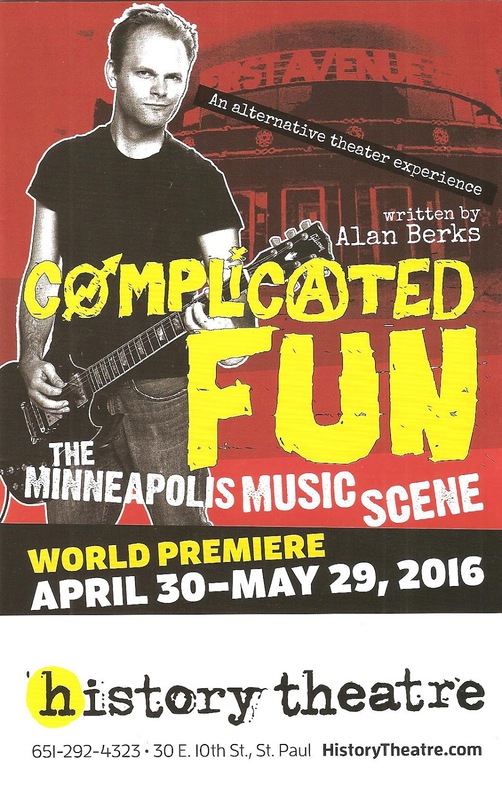 Whether you're a fan of this kind of music and spent your youth dancing in downtown Minneapolis clubs, or a nerd who spent the '80s watching TV and doing homework, Complicated Fun is a compelling new play with music that tells an important piece of Minnesota history, integrating music into the story in an exciting and organic way. Complicated Fun continues at the History Theatre in (ironically) downtown St. Paul through May 29.